Making your cards for your friends and family can be an enjoyable hobby. When you design your greeting cards, you have control over the look and sentiment so that your card delivers just the right message. Taking the time to make a greeting card personally, lets the receiver know just how special they are to you. Anyone can go to the store, grab a card from the shelf and mail it, but making one with your hands shows just how much you care about the person that receives the card. There are card crafts for ever level of crafter ranging from the simple to the complex. If you are a beginning card maker, you might appreciate some of the next card making tips and tricks. They will help you avoid many of the mistakes and problems beginning greeting card crafters face, helping kick up your card designs up a notch. A Tip to Help You Determine Your Card's Background Color. Many times beginners don't have a clue determining which colors to use. A simple way to get excellent results is to pick a color from the image you are using and make that your cardstock background color. Use one or two more colors from the picture to add similar colored embellishments and accents to your card. Reuse Your Leftover Paper Scraps. Beautiful papers are not cheap. Make sure to repurpose your saved paper scraps. You can always use your punches and die cut machine to cut simple shapes from the scrap paper. Use those paper shapes to embellish your cards. Who doesn't want to save money? Look Beyond the Normal Sources for Your Paper Supplies. Did you ever go to the card section of the store and noticed the beautiful gift bags and wrapping papers available for sale? Who says you can't use unconventional paper sources for cardmaking? Gift bags are often made from a heavier weight of paper that is just the right weight for card making. All you have to do is unfold the bags and cut out the shapes you need, making sure to avoid the creased lines. Wrapping paper is a bit thin, so you may have to reinforce it with some heavier paper as a backer. You may have to do a little more work with these papers, but they will be a beautiful addition to your card design. Just use spray adhesive to attach wrapping paper to card stock. Make sure to lay the wrapping paper down carefully onto the sprayed cardstock, then flatten down with your finger or a bone folder so that you do not get creases or air bubbles in the wrapping paper. Use a White Polymer Eraser. When laying out cut paper shapes onto a card people will often use a pencil to make light marks as a placement guide. After adhering your embellishments, the pencil marks need to be erased. Make sure only to use a white polymer eraser. Pink erasers and worse yet pencil erasers will leave dark spots and smudges on your card. Use some corner punches to give your card interest and a professional look. A simple 10mm corner punch will give you great results. You can also use the punch to give your photos and business cards an updated look. Use Foam Tape Squares and Dots to add Dimension to Your Cards. Part of the fun of making cards is that you can quickly take them one step further from retail cards by adding elements with dimension. Foam tape and dots give just enough space between the items on the face of your card project to make them pop. Sometimes you want to attach elements to your cards to determine placement. You might wish to test various designs before choosing the final layout. Tape can be weakened by placing it on cloth and ripping it off several times. Your card background will be not be damaged from the distressed tape. If you are using water soluble ink, spray a bit of cold water (no soap) onto your stamp and dab it dry with a paper towel or clean cloth. Do not scrub your stamp because you may damage the surface of the stamp and render it useless. Proper care will help your stamps last a long time. Make some cards that are simple in design and use them for multiple occasions. When the need for a card arises, and you are short on time, all you have to do is stamp the appropriate sentiment onto the card, and you are finished. Easy peasy! Have a storage box with file folders for each month of the year. Make your cards ahead of time and store them in the appropriate month's file folder. At the beginning of each month, pull out the cards and mail them. Never be rushed to make a card again! Ribbons are a beautiful touch to card design, but sometimes you will find that the ends will fray. An easy fix to this problem is applying a bit of clear nail polish to the ends. No more fraying! 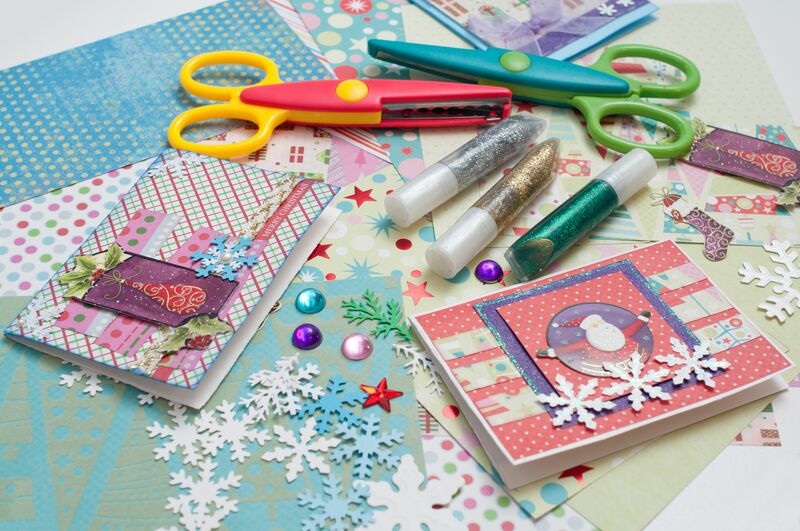 Are you in the middle of making a card and find that you have run out of foam tape or dots? You don't have to fret. A quick fix is to cut a piece of foam board into the desired shape and use glue to attach to the card background. Instant dimension! Learn how to make cards using different folding techniques. Your cards will be exciting and fun. Beccy Muir, a card maker from Australia gives 129 examples and tutorials for card folding and design. What an inspiring source! Make sure to check out her blog. You will be spurred to get creative and start making those cards! These 13 card making tips and tricks are just the beginning. If you find that you are bitten by the card making bug, you will find it helpful to look at magazines, books and the web for inspiration. Take some card making classes at your local craft store to increase your knowledge and design levels. Classes are also an excellent place to meet like-minded people that will be glad to share their knowledge and crafting enthusiasm with you!